These past few weeks I’ve been drowning in apples from my apple tree. I was super excited about having so many apples so I could easily make my slow cooker spiced applesauce and slow cooker apple butter. But I wanted to make a dessert as well. One that actually took more than a cup or two of apples to make since our supply was so plentiful. 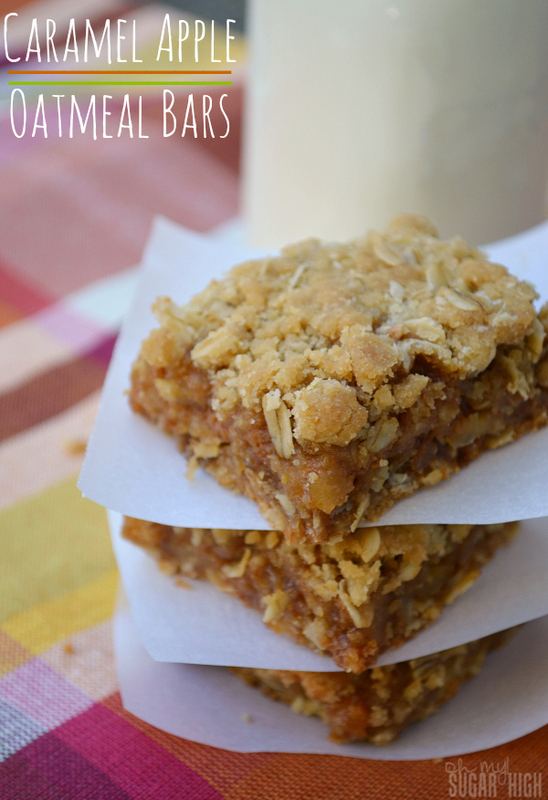 These caramel apple oatmeal bars were the perfect way to use up apples and tasted fabulous. They are an altered version of these highly rated caramel apple bars from Betty Crocker. Beat brown sugar, butter and shortening in large bowl until well combined. Stir in 1 3/4 cups flour, oats, salt and baking soda. Set aside 2 cups of the oat mixture. 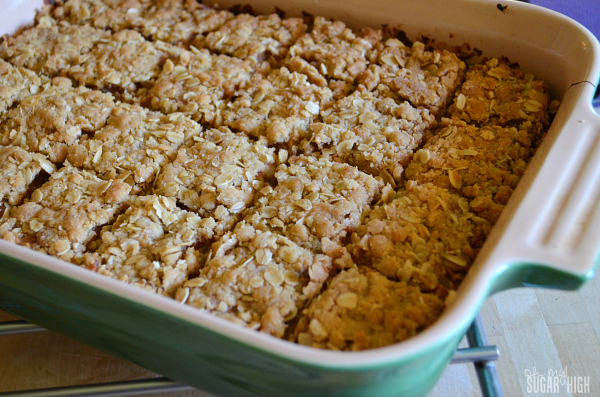 Press remaining oat mixture in ungreased 13″x9″ baking pan to create the crust. 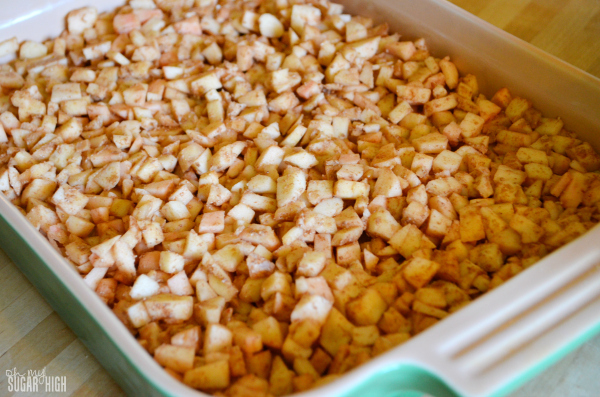 Stir together apples, 3 tablespoons flour, cinnamon and nutmeg. Spread apples over oatmeal crust over. In microwavable bowl, heat caramels and milk for approximately 1 minute. Stir. Cook another 30 seconds and stir, repeating just until caramels are fully melted. Stir in vanilla. Pour caramel evenly over apples. Sprinkle with reserved oat mixture and press down gently. For 24 bars, cut into 6 rows by 4 rows while still warm. Keep covered and store in refrigerator until serving. 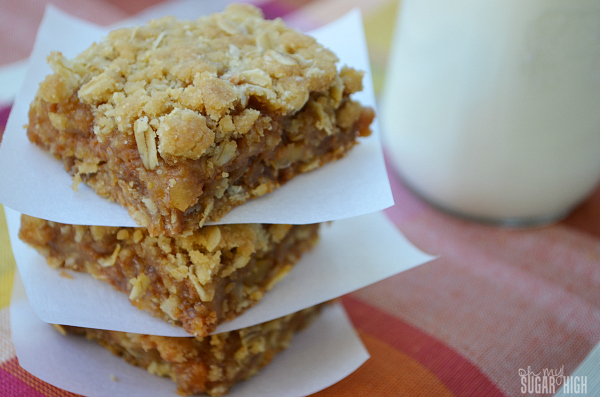 I couldn’t make these delicious bars without tossing in some cinnamon and nutmeg with the apples. It just feels wrong otherwise. And I’ve never been fan of melting caramels without a bit of milk to make it smoother and a little vanilla for flavor. These turned out drool worthy. So good that my two year old is sitting on my lap right now and looking at this picture asking for some and telling me, “mmmmm, mama, mmmmmm.” He helped me make them and remembers how tasty they turned out! Too bad they were gone so quickly.